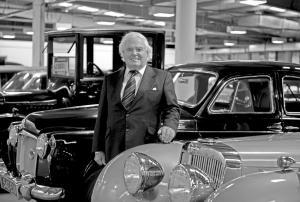 Sir Arnold Clark, the UK’s first billionaire car dealer who started his company by buying a Morris Ten Four with demob cash, has died at the age of 89. In a statement Sir Arnold’s family said he has passed away peacefully yesterday morning, 10 April 2017. They said he was a “beloved husband, father, grandfather and a great friend and employer to many”. Arnold Clark Automobiles, the company he founded in the 1950s and today Britain’s biggest independent group of car dealerships, praised Sir Arnold as a “truly inspirational business leader”. Glasgow-born Sir Arnold, knighted in 2004, was confirmed as Britain’s first billionaire car dealer in the Sunday Times Rich List 2016. After leaving the Royal Air Force in the early 1950s, the businessman used his demob money to buy a Morris Ten Four for £70. After restoring the car he sold it on for a profit and then started to buy and sell more cars, opening the first Arnold Clark showroom on Glasgow’s Park Road in 1954. Today Arnold Clark Automobiles has 200 dealerships across the UK with more than 18,000 new and used cars in stock. It posted profits of £107.2 million in 2014. A statement from Sir Arnold’s family said: “Sir Arnold Clark passed away peacefully this morning, 10 April 2017, surrounded by his family. He was a beloved husband, father, grandfather and a great friend and employer to many. “He was an inspiration and the family will continue to carry on his vision. “He will be greatly missed. “We wish to thank all those who have sent messages of condolence and appreciate your kind support. A statement from Arnold Clark Automobiles read: “Sir Arnold was a beloved husband, father, grandfather and a great friend and employer to many. Sir Arnold, who was awarded the Lifetime Achievement Award at the Car Dealer Used Car Awards in 2015, opened his first site in England with a retail operation in Liverpool in 1994. In 2007 Arnold Clark Automobiles invested £10 million in a new custom-built staff training facility in Glasgow’s Clydeside area. The company celebrated its 60th birthday in 2004.